This recipe combines the great flavors of eggplants, sun dried tomatoes and goat cheese. Quick to put together, yet delicious, this recipes will soon become a family favorite. Preheat oven to 450. Place eggplant cubes in colander lightly sprinkled with salt. Allow to stand 30 minutes. Pour olive oil in baking dish, add eggplant & toss well to combine. Place in roasting pan & roast till browned, about 20 minutes. In food processor, put sun dried tomatoes, parsley, 2 tablespoons of oil and pulse. 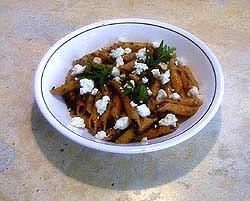 Cook penne pasta al dente. Add eggplant, sun dried tomato paste & toss well. Sprinkle with goat cheese, and serve.